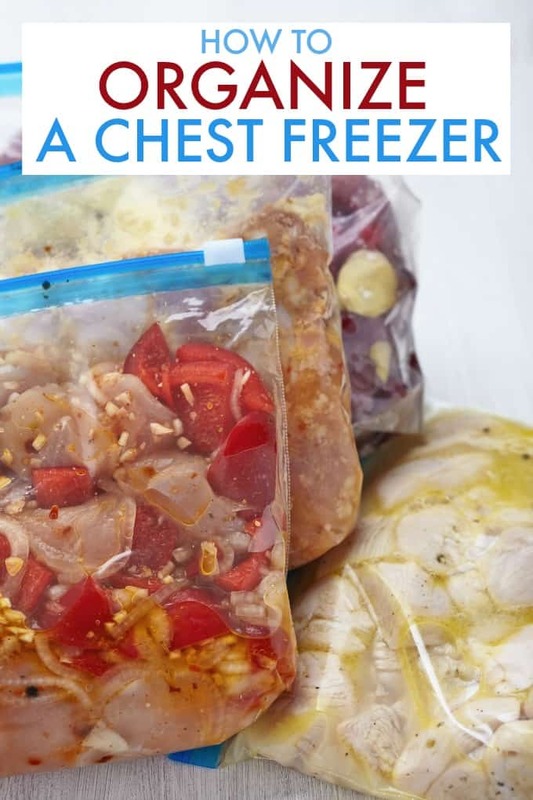 Your chest freezer can be the key to saving money, saving your weeknight dinner sanity and making feeding your family a breeze. What? Is it a magical unicorn? It can be, if you get organized and stay that way! Discover how to organize a chest freezer and keep it that way! Batch cooking and freezing meals has long been known as the perfect way to save money and have food at the ready that your family likes, so you can skip the drawer of take out menus. Buying some foods in bulk can save a lot in terms of the portion cost. But if you’ve had a chest freezer for some time, it might be a black hole of lost meals, rogue peas and some unidentifiable package that could become a science project, if thawed. When you plan to get organized to get maximum use from your chest freezer, take the opportunity to give it a deep clean. That is, remove EVERYTHING and get rid of anything that is too old, too frostbitten or completely unidentifiable. Store the rest in your fridge freezer for an hour, while you clean up! Remove the hanging basket(s) if you have them, and give the whole thing a thorough scrub, top to bottom! Remember to unplug it first! Keeping like with like is the easiest way to ensure that you can find what you’re looking for: frozen veggies with frozen veggies. Meats with meats. That way, when you toss in that ground beef that you bought for next week’s taco night, you’ll know where to look for it! The easiest way to keep items together is to get some plastic containers or baskets at the dollar store and fit them in like Tetris puzzle pieces. If you can get different colours, so that you can colour code your foods, even better: red for meat, green for veggies… It makes ‘at a glance’ even faster! If you’re planning to pile bins in two layers, make sure they have handles so you can pull them out to get to what’s underneath. TIP: If you plan to freeze things like steak, bought fresh, wrap them up individually before putting them in the red meat box / bag. This way, you can pull the number of steaks you need to thaw on any given evening without having to chisel two or more of them apart! Label, label, label… and lists! Finding a container filled with what you assume is stew is the fast path to tossing the item, rather than thawing it just to find out it’s actually bean soup! Waste costs money, so save yourself some beans and a lot of cents by labelling each item carefully, with a freezer resistant label. On the outside of the freezer, you should have a white board or a paper list where you keep an inventory of everything that is in the chest. That way, before you head out to the grocery store, you can, at a glance, see if you’re running short of your essentials. The other advantage is that you’ll be able to see that you already have four packages of frozen corn so you can skip this week’s sale price and head over to the ice cream section instead. Win! Your list can also help you with your meal planning and ensure that you rotate out food that’s been there a mite too long! Save time when you’re cooking by having certain things in a hanging basket (if your freezer has one) or in a separate bin. Like what? Tupperware containers and product packaging take up too much space. Put as much as you can in freezer bags and into the right basket. You can always keep the cooking instructions for anything that was in a package outside the freezer! If you’re cooking and freezing soups, sauces or entire meals, freeze them in portions that make sense for your family. If everyone is always eating at different times, single size portions will save time and money. If you eat together most of the time, make it a family sized portion. You’ll waste less if your meals are stored pretty much as you would need them. TIP: Freeze soup and stews in large freezer bags flat and then store them upright in a magazine file box. They take up WAY less space this way! If you can’t open it easily and quickly, you won’t use it and they do take up a surprising amount of energy, so make sure you are getting maximum benefit from your chest freezer by making sure you can get into it! With all that organizing, you’ll be able to store food like the squirrel who stores his nuts for winter, saving you time and money, all year round. You might also enjoy these top of the fridge storage ideas, how to organize your freezer, refrigerator organization tips and kitchen inventory printables.